In 1733, the Dutchman Herman Boerhaave invented a still equipped with a cone that purified the alcoholic vapours, increasing the alcoholic strength, and thus created the very first stripping column. It was a rudimentary tool that also needed some modifications. The history of still continued slowly over time until the 19th century, when the technological age exploded. Taking up the insight of Della Porta, in 1813 the Florentine Baglioni invented the stripping column, inserting inside it small plates with bells and down-tubes. In this way it was like having several stills stacked on top of each other, and the distillate produced was richer in alcohol, thus shortening the entire process. 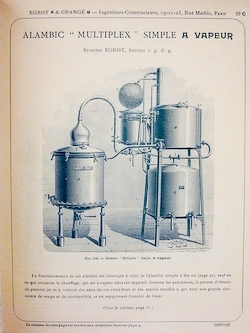 In the mid-19th century, Enrico Comboni, a chemistry teacher at the oenology schools in Conegliano and Asti, laid the grounds for steam distillation. He arranged the still in such a way that the marc put inside the boiler was crossed by a flow of vapour, bringing with it fragrances and alcoholic substances. At this point, technology provided everything indispensable for correct manual distillation, leaving the final touch to the sensitivity of the master distiller. Nevertheless, in the middle of the last century, Grappa began to be made with industrial continuous alcohol extractors, which soon took over the market. These sophisticated technologies, operating with continuous cycle, have produced greater quantities of Grappa, ending with a product that is reliably predictable but somewhat lacking in character: because good Grappa is the result of patience, devotion, artisan skill and expertise handed down over the centuries.